"Alaska Gold Trails. Volume IV. 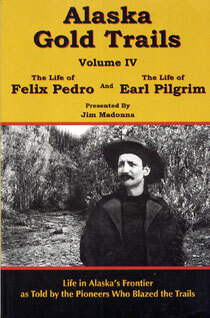 The life of Felix Pedro and The life of Earl Pilgrim"
In the late-1980's Jim Madonna interviewed scores of Alaskan pioneers on his Alaska Gold Trails weekly radio show. Jim was fascinated by thè stories and they inspired him to research thè lives of two colorful Alaskan pioneers who were important in early prospecting and mining history. The lives of Felix Pedro and Earl Pilgrim are presented here for your reading pleasure.